When leading organizations today, most leaders think of resistance to business change as the enemy: a force to minimize, eliminate or avoid. And, if you wait until everyone in the organization is aligned and on board (or over-emphasize team consensus) you miss out on good opportunities to grow. Today, I shed light on the true meaning of resistance and share three specific ways you can harness this natural force to increase your organizational change results (and stop viewing it as a force to judge, ignore or eradicate). #1 – Resistance to change is always present. “For every action, there is an equal and opposite reaction” is Newton’s 3rd Law of Motion. When an object pushes another object, it is met by equally hard push-back in the opposite direction. What is true in the physical world, is true in business. 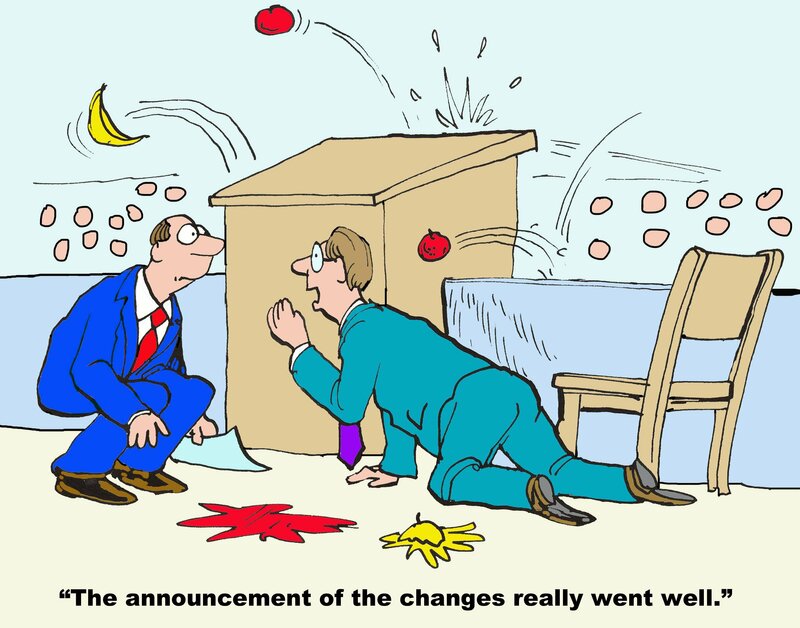 When a big change is announced, especially one that is perceived as impacting a person’s job, it creates fear and skepticism, which spreads quickly if left unchecked. Resistance to change is a signal to leaders that they have done a good job of communicating the change, but perhaps not a sufficient job of creating buy-in or a “felt need” for the change. Including the sacrifices needed. This stimulates passive change resistance: Some people comply but are not going the extra mile. Whatever the case, the WHY isn’t relevant or big enough for them. Lack of resistance = lack of bold action. In American culture, the days of announcing organizational changes and assuming everyone will march in unison, no longer exist. “Compliance to the boss” doesn’t cut it in the modern workplace. Younger generations just quit. This is not only about having better change management programs. It’s about fundamental shifts in the mindset you hold about change: viewing it beyond financial results to create a social movement with a meaningful purpose. (If this seems like hooey to you, you are not alone.) Times have changed; if you’re not on this train, you will be left behind. When you accept resistance to change is always a factor (visible or invisible), and understand it as an emotional force that must be understood and respected – you quicken the physical movement towards the vision. This powerful mindset shift helps leaders drop judgments about people who aren’t on board. They focus instead on understanding what’s behind their fears, opening the door to a meaningful dialogue about why the change is so important to the business. This is not difficult to do, once you buy-in to the mindset behind it. There are many creative ways to get this right. #2 – Resistance is a strengthening force. What happens when I add resistance to my exercise program? I use more energy which in turn, burns more calories. Ultimately, resistance training creates greater physical strength. My willingness to keep pulling or pushing or pumping is the law of physics at work, the fuel for strength, stamina, endurance. Medicine and crop yields offer us important lessons about resistance as well: the greater we introduce human interventions to kill bacteria or pests, the greater the host’s susceptibility to disease. (Think: Antibiotics, pesticides.) Eradicating resistance to change through chemicals – or ignorance – only serves to make it stronger. When you introduce healthy resistance to change: inviting “what if we don’t do this” and “that will never work” conversations in a structured way, at the right time it allows the idea, innovation or change to become stronger. It also builds trust in the leader, by showing he or she is open to diverse points of view, so long as their inquiry influences the final outcome, and is more than a check-the-box exercise. Asking hard questions about the downside of the change doesn’t mean you’ll reverse your position. Rather, it strengthens the team or organization’s “implementation muscles” by exploring the pitfalls and realities necessary to succeed at the change. (2) Future scenario planning, with a robust exploration of potential challenges or problems. By embracing resistance to change as an ally, you create a stronger team. #3 – Resistance to change is a mirror. If your team is feeling this change is “Too Much Right Now!” or that the “Costs Outweigh the Benefits” – consider it a mirror for deeper examination into areas of doubt or concern – whether within yourself or more broadly. The leadership needed from your team (or by the organization) is being reflected more through non-compliance or dis-engagement, than through positive signals. One CEO we worked with, had a very ambitious growth agenda for 2018 (and beyond.) Her team was steadily increasing their workloads and hours, working harder and longer to accommodate the rapid growth/change. They did so because they trusted and wanted to please her; she had built a very healthy, positive workplace culture. And yet, burning out was a real risk from unrelenting workloads and turnover in key positions – but they didn’t know how to speak up about it. This underbelly of concern was unexposed because people didn’t want to let her down. The situation was not anyone’s “fault.” It simply had not been a cultivated conversation. Embracing push-back, using it to strengthen the cause, and respecting people and their views melts resistance to change faster than any PowerPoint deck or glitzy Kick-Off meeting. Leading Big Change in Your Company? My Change Game – a ground-breaking, interactive board game for building collaboration and teamwork. Great for off-site retreats, Leadership Universities, or a Kick-Off. Modern Culture Academy – a virtual program for improving culture as your #1 profit center. 12 HRCI business credits.